Pretty Little Liars' Halloween gift from A! 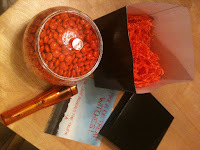 (Super cute bowl of M&Ms that say "Trick" and "or Trick" and "-A") and a hidden link. 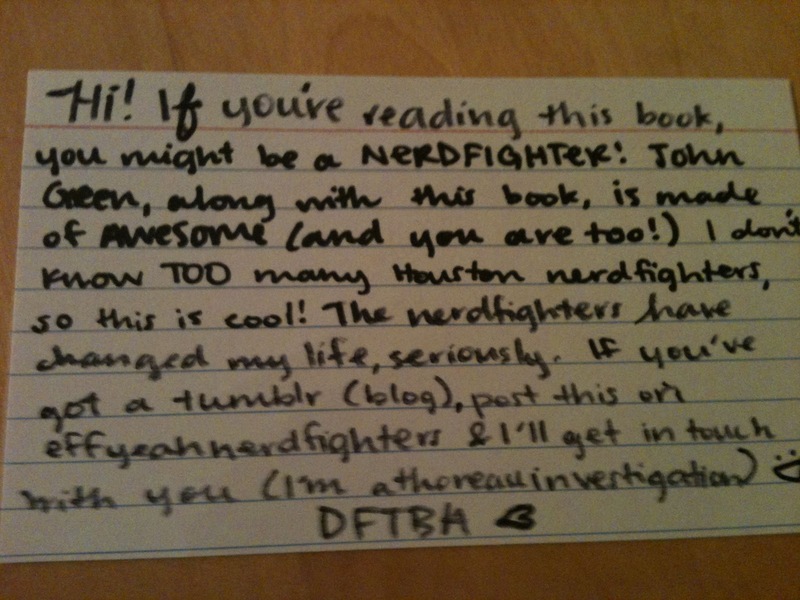 Will Grayson, Will Grayson by John Green and David Levithan (book + audiobook) There was a cool note inside (on picture above) and I'm still trying to contact this awesome Houston nerdfighter!! Oh. My. God. You got Real Live Boyfriends. You're sooooooooo lucky! 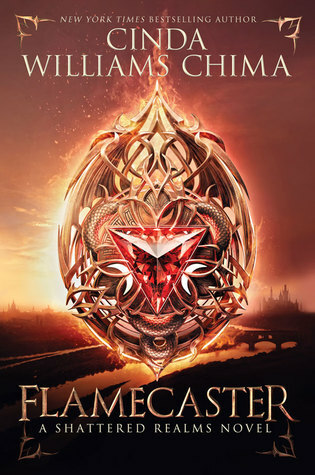 I'm DYING to get that book! I really hope that you enjoy it!!! Oh my gosh. E. Lockhart! I'm exciteeeed!!! Ahh! You've got uber awesome stuffs this week. AH! LUCKY! Happy reading! :D and Happy halloween! It's so weird you mention that note because I was in the bookstore yesterday and found a note in Paper Towns! And I'm from Texas too! haha I thought it was really neat. What a cool week! 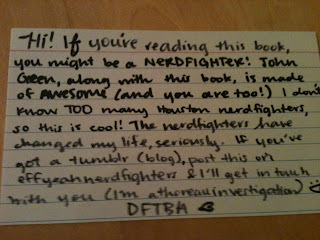 I love the Nerdfighters note you found in the book (LOVE it!) and the Pretty Little Liars random surprise is awesome! Also, Real Live Boyfriends is bound to be hilarious. I love the note! That's so cool!! 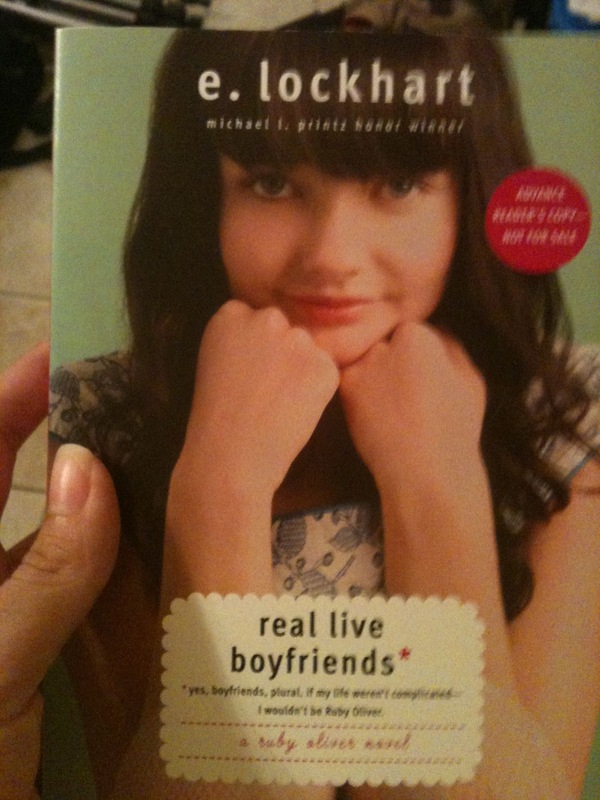 I NEED to read Will Grayson asap! I LOVE David Levithan! Enjoy all your new reads!! And Happy Halloween!! Happy reading! That Pretty Little Liars box is soo cool. I am jealous of everyone who gets it haha. Oh my goodness!! :D I left that note (in Will Grayson Will Grayson) and someone was kind enough to tell me on my tumblr :D So I'm not exactly sure how this blog works, but who exactly sent it in? Hey Sahifah! It was me, Sabrina. This is my blog. I cant figure out how to write something on your Tumblr.. Do you have a twitter? Hope you like WG, WG! Have fun with the Pretty Little Liars thing too. No, I don't! D: If you have a Tumblr, it should just be athoreauinvestigation.tumblr.com/ask, but if you don't, I'll enable anonymous questions for a couple of days for you! !